In the early days of the Web information exchange was essentially text-based, and effected either via FTP or Telnet. Compared to modern-day surfing this may seem rather tame, but it was new technology, and by the standards of the time it was pioneering. Text-only browsers still exist - the best known is Lynx, which was developed at the University of Kansas. Version 2.4.2 was released in 1995, since when it has been maintained by a group of volunteers. The current version is 2.8.2. 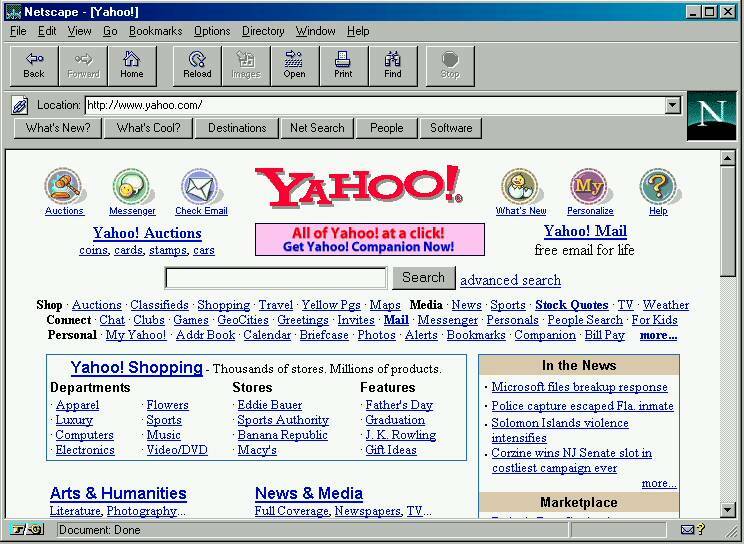 The screenshot below shows the Yahoo! 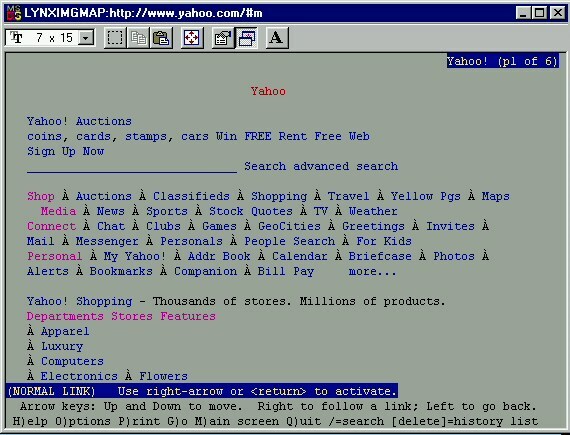 home page displayed in Lynx. As you can see, it runs in a DOS window and navigation between links is by arrow keys - there is no mouse functionality. Why use a text-only browser nowadays? If you are blind, or partially sighted, then there's little point in spending your hard-earned dollars on fancy graphics capabilities, and much less in wasting time waiting for images to download that you cannot see. Far better to have a small footprint browser (the Lynx platform is only 1.5Mb) that is speedy, and can readily link to speech rendering software. The real groundbreaker in graphical browsers was Mosaic, developed by Marc Andreessen and Eric Bina of the National Centre for Supercomputing Applications (NCSA) at the University of Illinois. Mosaic was originally designed and programmed for the X platform, but it was as a Windows application that it achieved its greatest exposure and penetration. Version 1.0 was released in April, 1993, followed by two maintenance releases during summer, 1993. Version 2.0 was released in December, 1993, along with version 1.0 releases for both the Apple Macintosh and Microsoft Windows platforms. The current version is 3.0 Beta 4, released on 14th September 1996. Mosaic was able to render pages in a style familiar to users of Windows and Mac PC's, and could incorporate high-quality graphic images on the page. The footprint is small, being only 2.09Mb. Even with Mosaic, web surfing was still remarkably similar to browsing through a paper publication. Page content was static. One could navigate to other pages, and sites, via 'hyperlinks' - highlighted portions of text which triggered an http request to be sent to the site server, but that was no different in concept from flicking through the pages of a magazine. What was needed was animation, and the vehicle to deliver this was Java. Java was a solution looking for a problem. It was a spin-off from the "Green Project" at Sun Microsystems in the early 1990's, which was aimed at the development of interactive TV. A light, processor-independent language was required to deliver this capability and Java (or Oak, as it was originally called) was created for this purpose by James Gosling. 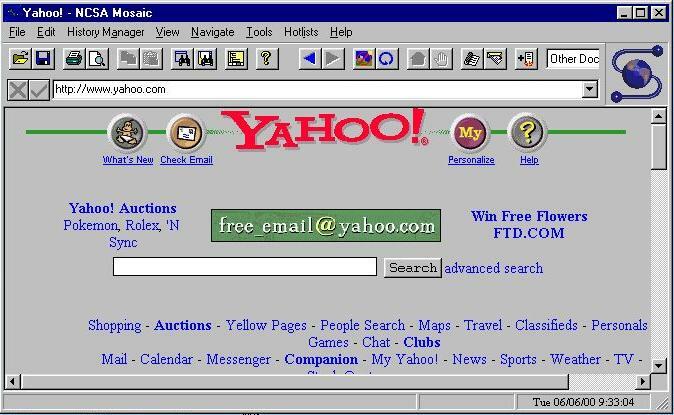 The set-top concept was ahead of its time, but Sun saw the growing popularity of the Internet as an alternative opportunity. The team created a Mosaic look-alike named "Web Runner", written in Java, and in 1995 James Gosling gave a demonstration of its capabilities at a conference in Monterey. It was an instant success. 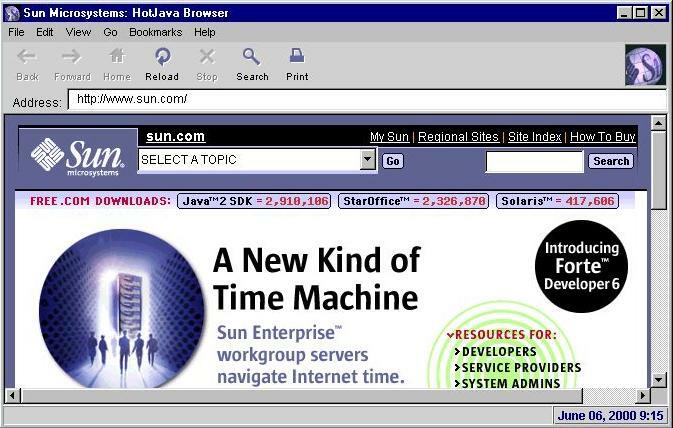 On May 23rd 1995 Sun and Netscape announced to the world that Java was to be incorporated into future releases of Netscape Navigator - at that time the most widely-used browser. For more information on Java read the linked article on the third birthday celebrations in 1998. For a download of the Hot Java browser visit the Sun Microsystems website. Cascading Style Sheets are a means of centrally controlling the formatting of a web page. Elements of the page such as paragraphs, divs or spans can be assigned a classname and the style of the entire class set centrally, either in the header of the page or in an external file. The central style can be overridden by in-line formatting. The current standard CSS-1 has been an official W3C recommendation since 17th December 1996. Without going into detail it is fair to say that Internet Explorer has been better than Navigator in complying with both HTML 4.0 and CSS-1. It is in their implementation of a Document Object Model and associated event handling that Netscape and Microsoft have diverged most. 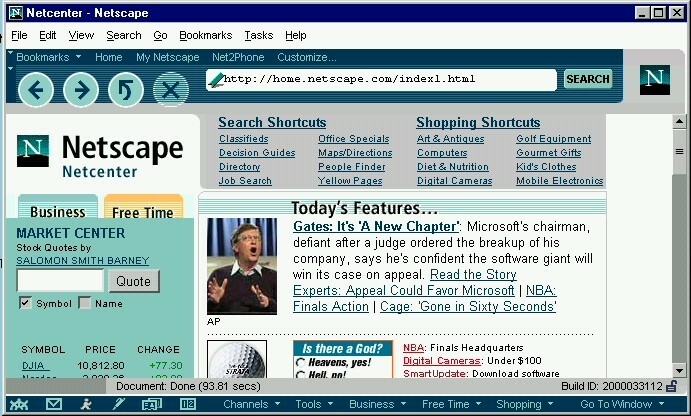 Navigator 2 and Internet Explorer 3 were able to dynamically change the contents of certain HTML elements such as textboxes, but in order to give scripters greater dynamic control of the style and position of HTML elements Netscape incorporated the a new object - the 'Layer', into Navigator 4 in 1997. Layers were set on a page using the <LAYER> tag referred to above, and scripts could dynamically change many characteristics of the Layer content. Microsoft took a different approach, and in Internet Explorer 4 they exposed all HTML elements to scripting control through the implementation of the document.all collection. 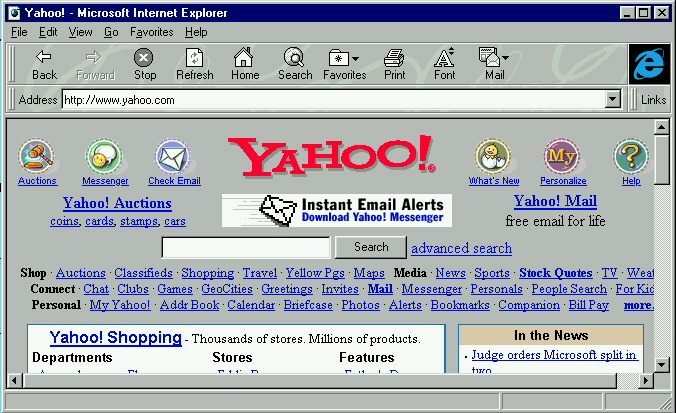 The two approaches were incompatible, as were the event handling characteristics of the rival browsers, and led to the current situtation in which web designers have to resort to ingenious, but ugly and messy cross-browser scripts to ensure that their pages will render satisfactorily in both Navigator and Internet Explorer. The W3C published their DOM 1 standard as an official recommendation on 1st October 1998. This is partially supported by Internet Explorer 5, and will be fully supported in Navigator 6 which is currently at preview release stage (see below). The latest version of the DOM 2 standard was issued on 10th May 2000. This is still at a consultative stage, though it is likely that most of the features it proposes in relation to event handling will pass though into the final version. Style in this context refers not to the technical use of the term as in Cascading Style Sheets, but to the general look and feel of the browser interface. Two different approaches appear to have evolved. Internet Explorer has, through its various incarnations, presented the appearance of an application whose chrome (i.e. buttons, title bars) is functional and subservient to the style of the page being displayed. 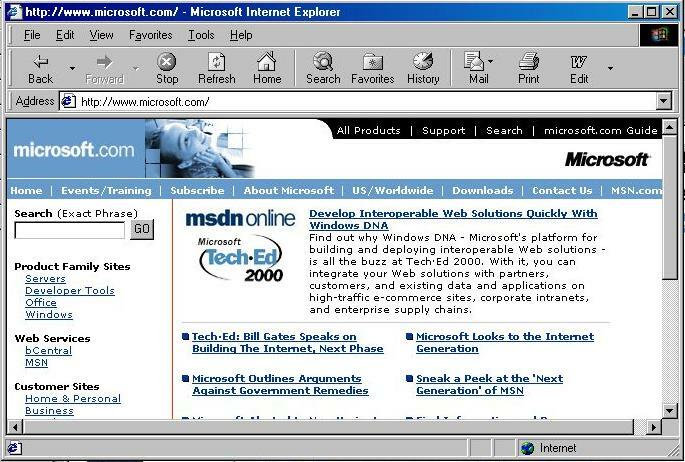 Thus there is very little difference in style between the screenshot of IE 3.02 above and IE 5.0 below. 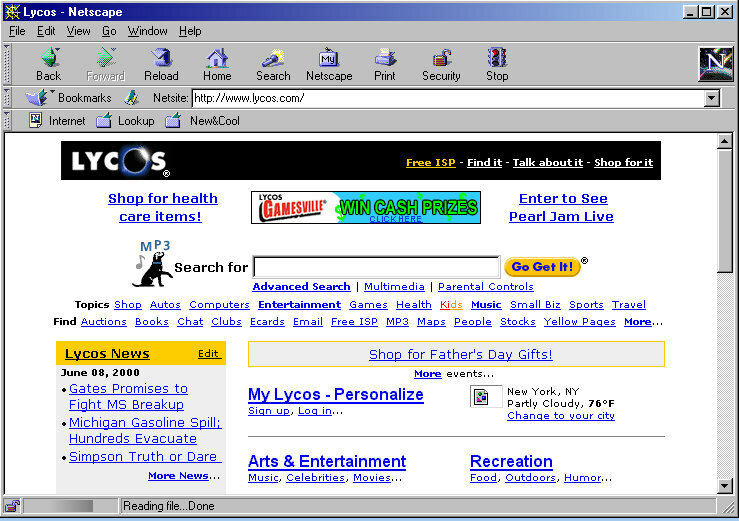 In comparison, Netscape has gone for the "shop window" style in the latest version of Navigator. The different styles appeal to different types of web user. Web designers tend to prefer the "application" style, and many of them are critical of the Navigator look and feel. There are however many non-technical users who prefer the "shop window". 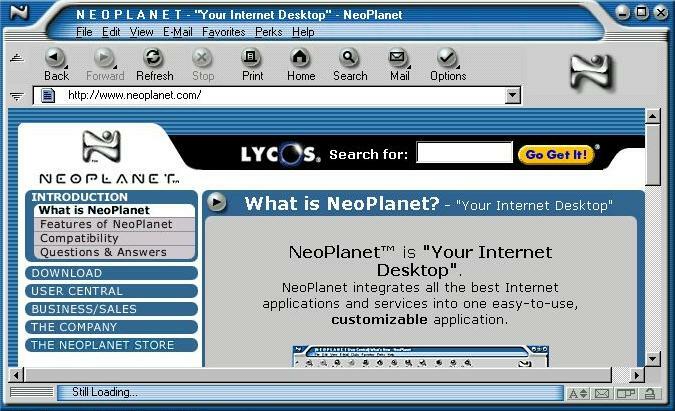 For these users there are alternatives to Netscape such as Neoplanet. This is essentially an Internet Explorer browser dressed up in a shop window style or "skin". Neoplanet offers 25 alternative skins which can be downloaded, and for those who want to go a stage further there are instructions on how to design your own skin. These can be uploaded to the Neoplanet skin archive and made available to others. If anyone is in any doubt as to the popularity of all this - there are currently 601 skins in the archive, and as of 8th June 2000 a total of 9,252,345 downloads had been supplied. Web designers - ignore this at your peril! Although the vast majority of surfers use either navigator or Internet Explorer in one form or another there are alternatives available. Lynx has already been mentioned. The following is a list of all the current browsers of which I am aware. Browser development does not take place in a vacuum, and is driven by improvements in hardware capabilities. At the moment the mainstream of development is towards lean customizable browsers capable of being ported to devices such as set top boxes, mobile phones, video phones and such like. And of course of someone were to come up with a truly 3-dimensional display for PC monitors that would trigger another new generation of Navigator and Internet Explorer. If you fancy a ride on a vintage browser then all of those mentioned above (with the exception of Viola) can be downloaded from the browser archive at www.evolt.org. Alternatively you can take a trip on a simulator at www.dejavu.org.